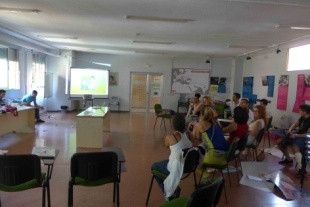 The workshop took place during the Month of June (2015), every Monday from 10:00 to 14:00. As part of the program of the Fundación Secretariado Gitano (FSG), the workshop was developed within a comprehensive program of training and capacity building for the job search. Why a workshop on the symbolic museum in all of us? Why mixing culture with job placement? Could a visit to a museum result helpful to find a job? From the research group EARTDI, the Complutense University of Madrid, the Thyssen Museum and the Fundación Secretariado Gitano, we believe that view an image, feel it, know its authors, its origins and its processes, know how to listen and watch, could be an opportunity to eliminate prejudices about the "closed" works of art, the feeling of "high culture" with the corresponding distance that could generate in young Roma people. Also, that it could turn to become a metaphor for themselves and also of gender relations that were established through the images. Through the workshop, we wanted to show how the museum could open up new narratives, create a symbolic universe of emotional memory that would help the participants to reflect on the external and internal prejudices, but also that it would help to build a small emotional territory of objects, images, sounds and textures. A territory of images that also tell them about themselves, as women and men with identity assigned by others, but with the right to appoint themselves in their own way. The museum opened to them to teach the treasures that the images saved: the same are only perceived if we open ourselves to look them in the eyes trying to open our consciousness to otherness. The first day, we started with a presentation guided by Alberto Gamoneda, educator of the Thyssen Museum with high capacity to enthuse. We met all in the education classroom and started talking about what is for us a museum and about our previous experiences when visiting it. Some of the young women and men had never been to a museum; they related how the guard was concerned that nobody exceed the line of contemplation of the works and how this made them feel insecure and observed. Alberto invited us to visit the permanent collection of the museum paying special attention to the following artworks: The Swing by Jean – Honoré Fragonard, Materials for a Leisure Hour - William Michael Harnett, New York City, 3 (unfinished)- Piet Mondrian,Untitled (Green on Maroon) - Mark Rothko. 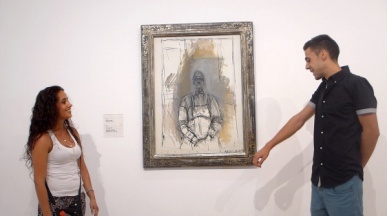 Observing the paintings, we talked about the ideas, prejudices, labels, functions, prescriptions and proscriptions of women and men belongings, spaces. 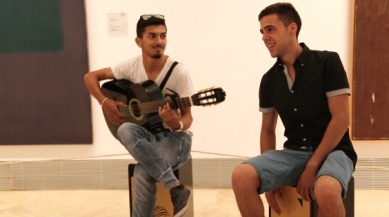 About the sounds and music evoked by the images, about feelings or emotions related to our own biographies. After that, back to the workshop, we found our own image in a mirror previously located in the room: this we know very well, now, looking at us defiantly. We understood the difference between mental and visual and began to understand how important is a look- a look not wanting to know prior knowledge, daring to be a source of knowledge. 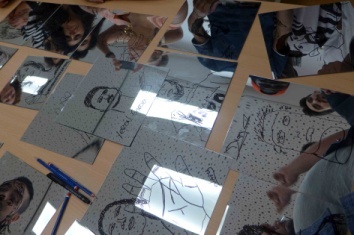 During the next session, we invited the group to try to create an own narrative through images. 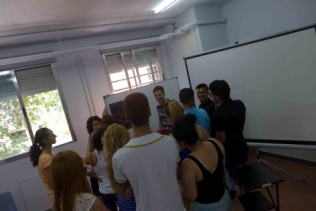 Participants have to choose a picture they like; then they have to think in two words related to the picture. Then, they write the words on the back of the picture. Once they have done this exercise, they pass the image to other partner and repeat the action again with another image, until the returning to them of the starting image. When the picture finally returned to each of them, we invited them to reflect on the relationship of the image with the words written by him/her and on what it has to do with her/his own biography. 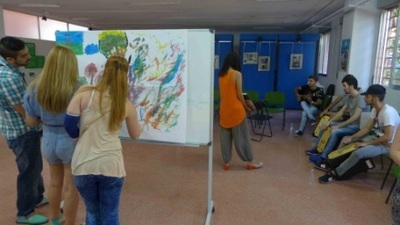 Then, we invited the participants to create their own work inspirited by the chosen works in the museum. We ask the participants to connect the image with their own memories using different materials to make the work: clay work, painting, crayons. The third day started with a small relaxation, then the participants were invited to imagine a color, imagine it, and think about the emotion associated with this color. Once the emotion was located, we invited them to locate then this emotion in a body part, being aware of the connection between emotion and body. Subsequently, each of the participants chose one or more images of the museum with which they wanted to work, trying to unite the history of each image with their personal narratives. To what extent do the narratives differ? To what extent do they intertwine? Why do we choose? What connecting elements do they have with our lives? From this reflection, each participant built a work trying to gather this narrative, and then share it with others, based on past experiences but delves into the life story through multiple ways to look at it. 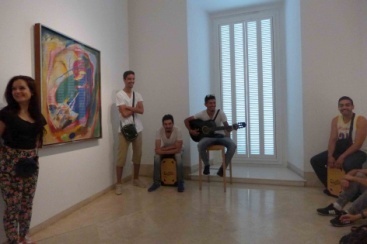 The fourth day, back to the Thyssen Museum, while talking about the paintings we had chosen, something unexpected happened: some participants, those who are more integrated and confidently, proposed to make their narratives through music, where they felt safer, with greater fluency and greater narrative capacity. One of the boys performed the "Hotel Room" by Edward Hopper with a load of feeling and emotion that became a transcendent experience, full of shared meaning. Encouraged by this experience, other participants performed the work of Wassily Kandinsky, through voice and palms. Two of the participants choose a work by Max Ernst, to define their identity. 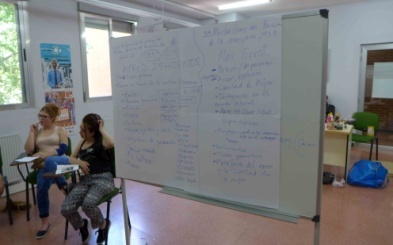 From that point, the group was invited to try to prepare a deeper presentation of the chosen work, individually, in pairs or in groups, with the idea to present it later to the general public in the museum. ​On the fifth day, which was developed in the Fundación del Secretariado Gitano, the participants individually, in pairs or in groups, deepened its relationship with the work chosen both through painting, music or singing. Gradually, a project appeared that linked through the image, two different realities that came together, not only on aesthetical level but also on emotional. 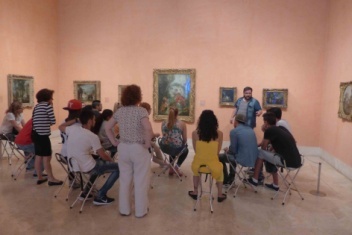 Then the communication part became present: how to transmit the feeling to the others, how to take a position, as awareness of the own body and breath, trying so to transmit the trip that had taken place through the artworks of the Thyssen Museum. 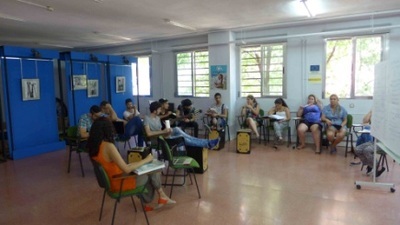 Each person, each group, each couple showed in the training how the communication of the own should likewise be done safely but also showing empathy toward the group. 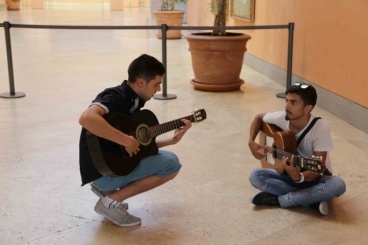 The sixth day, the result was presented to the museum visitors. ​Nervous but empowered by the knowledge acquired in the previous sessions, the presentations of the works made us vibrate. The interpretation of the Hotel room of Edward Hopper, managed to make us feel alone, unloved, but aware of a vital penalty that turned in communication with others. The work No 196 of Wassily Kandinsky, took us to a colorful abstraction translated into the flamenco percussion box, guitar and voice, which, for a moment, invaded the museum space, making us feel, vibrate and close our eyes to see better, finally, an image. The presentation of the Thirty-three girls looking the white butterfly of Max Ernst, took us to find a butterfly within the work, seeing how femininity sometimes also explodes as does the color in the work of Ernst. And we understood why that image had to do with a teenage identity, constantly changing, seeking and exploding. As a contrast, the work Untitled (Green on brown), Mark Rothko, was able to move us through the flamenco percussion box and voice, to an emotional mapping where the colors sink and protrude, as in a sea crossing through the spaces of affection and insight. Finally, the work Portrait of a Woman by Alberto Giacometti, became a narrative of the life of a man, a tribute to a grandfather, a man who knew to care and in whose affection, the gender changed and became an universal feeling in the eyes of a granddaughter. 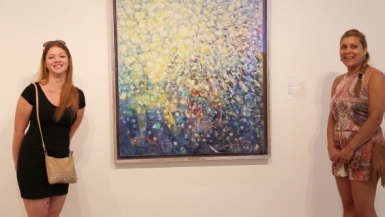 The granddaughter has traveled through that work to her childhood and had recognized in the body of the woman painted by Giacometti, the friendly face of someone who had loved her. The museum is a container of stories, as we are. A need to feel welcome, but also predisposed to get involved into the element of surprise and connection that each work brings when allowed us to look at.